I am often asked: "Did you paint that picture in Greece?" No, I painted it in Portugal. 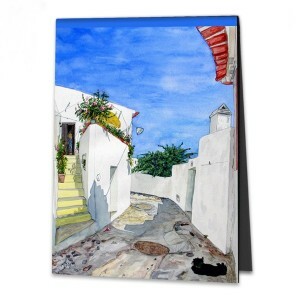 In front of a few Greek-style houses, under the radiant blue sky at midday, in the shadow of an awning I found a place to sit and began my picture. Suddenly the door opened and a kind old lady with a straw hat squinted in the sunlight. A black cat with a red collar scratched itself and walked out of the house. We both watched as it stretched out. "May I paint you?" I called to the woman on the terrace, "Just there, where you are now?" She nodded and held the door half open. While I sketched with nimble brushstrokes, the cat descended the stairs and took a spot in front of me in the shade. It did not notice me, but kept its owner in its sights. I quickly painted the cute black cat too. "Done!" I cried to Dona Aldina. She opened the door, stepping out completely into the sunlight. "A beautiful day, but much too hot, even under an awning. Still too early to water the plants, inside the house is the only place to be. The walls are nice and thick." As she went back into the house, the cat was quick to catch her up and scurried past her into the dark interior. The door closed and I stayed behind in the baking midday heat. I wanted to finish the painting that day, as who knows whether there would be clouds tomorrow, changing the light relationships completely. So I let the sun beat down on my legs, wiped away the beads of sweat and simply carried on painting. The awning provided no more shade, the metal paint block was glowing and the water in my jar was boiling. But then we arrived at the point where the picture and its strong contrasts was finished. I snapped my watercolour block shut, stowed away my painting things in my rucksack and just before I got sunstroke, I retired to Joao´s pub, where, with a cold drink I had quickly forgot the insane heat.